My review copy: Received from the author in exchange for an honest review. Bianca Corrotti's vineyard is more than a piece of mouth-watering real estate in Tuscany. It's an inheritance; a storehouse harboring the secrets of her Uncle Egisto, a world-class sculptor, and his troubled wife -- a woman whose destiny converges with Mussolini's when WWII overtakes them all. Based on a true story, Bianca's Vineyard follows a devoted family of strong-willed men and lion-hearted women waging an epic battle against a gathering storm intent on destroying their lives. "Oh, it was a tragic love affair. Many in our village still talk about it today." He glanced at Vittoria, her feet planted firmly in the sand, still staring unapologetically at David. "And some," he added, "have not learned to forgive." "Anarchy," he groused, "will be the death of us all!" It isn't often that I come across a historical fiction novel that is so heartfelt, so flavorful, and so utterly captivating, I gobble it down in just one sitting. I enjoy well researched, richly imagined and beautifully written historical fiction, but it's really rather rare for me to be able to get through one without having to pause and come up for air. Bianca's Vineyard is really quite a literary gemstone. From the very first page onward, I found myself completely immersed in the story, emotionally captivated, curious about the plot and characters, and simply unable to put it down. This is the kind of historical fiction I'd recommend even to those who don't usually enjoy the genre. Because while it's based on a true story and set against rich historical tapestry of Italy and USA during World War II, it's also - or perhaps most of all - just a phenomenally plotted, mesmerizing and heart-warming story of love, family bonds, loss, secrets, loyalty, departures and returns. Both the characters and the stunning historical background are extremely well written and fleshed out. The settings, the culture, the traditions and values - they're all authentic, vibrant and flavorful. You're right there in the middle of it all, surrounded by loud, passionate, opinionated Italians. And you can't help but love the experience - at least I know I did! The story stars before World War II and spans the years from 1913 to 2001, centering around the Bertozzi family - Egisto and Armida in particular. It takes place in Italy and in America, and it explores both cultures brilliantly. It's dramatic, it's mysterious, it's romantic and inspiring, but it's also at times heartbreaking and illuminating. And I promise you, once you start reading you will be lost to the world. You'll not want to stop. Both Amida and Egisto are not easy characters to like initially, though as the story progresses, we grow to care about them and root for them. Egisto is very stubborn and proud, he has his opinions and beliefs and he is going to stand by them, no matter what. He doesn't always think through his actions and it often gets him in trouble. At the same time, he is dedicated, passionate and loving. Amida is a troubled young woman who goes though so much- too much! Her story really is emotionally affecting and the way she manages to affect all the people around her is fascinating. Bianca's Vineyard is a beautiful and touching story. An epic family saga set against WWII backdrop, breathtaking, intense and deeply moving. I really loved this book and highly recommend picking it up, even if historical fic is not usually your cup of tea. 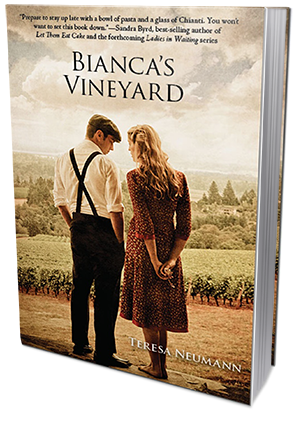 Teresa Neumann was raised in a large, boisterous Irish-Catholic family from Iowa and is the author of “Bianca’s Vineyard,” and its sequel, “Domenico’s Table.” Both books are based on the true stories of her husband’s Italian family in Tuscany. She has lived in Oregon for over 30 years with her husband and three children. 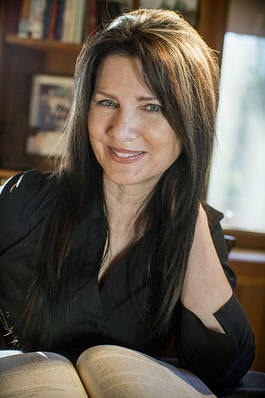 In addition to enjoying family, writing, reading, meeting her readers, wine tasting, traveling, and all things Italian, Teresa loves playing the fiddle with other musicians. For more information on Teresa Neumann and her novels please visit her website and blog. You can also connect with her on Facebook,Twitter, and Goodreads. To win a Kindle eBook of Bianca’s Vineyard please complete the Rafflecopter giveaway form below. Two copies are up for grabs. Giveaway is open to US residents only. Giveaway ends at 11:59pm on August 26th. You must be 18 or older to enter. Winner will be chosen via Rafflecopter on August 27th and notified via email.